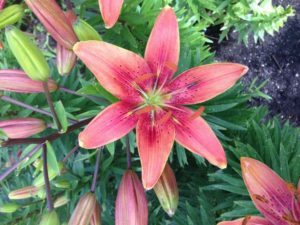 When it comes to choosing a lily for the garden, the possibilities can be overwhelming. Lily breeders work with species hardy to their region to develop plants that display desirable characteristics such as flower size and shape, colour and, markings as well as plant hardiness, variations in height etc. 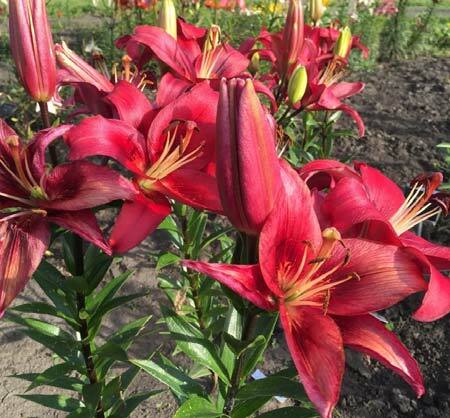 Those breeding programs result in new lily hybrids and cultivars being available every year, expanding the options even more and making it very difficult to sort through. 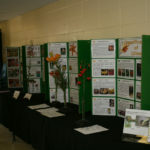 In 1964 the Royal Horticultural Society in England – the recognized authoritative source on lilies(http://www.rhslilygroup.org/) – introduced a system for grouping them. Sorted according to their parentage then by flower shape, the result was nine divisions each identified by a Roman numeral. Groups usually contain several similar species and hybrid cultivars developed from those species. 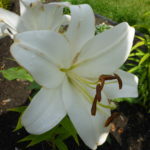 The origins of the species used in breeding for each Division may provide some insight as to the hardiness of the lily. This system is in wide use in publications, lily shows and by suppliers, making a familiarity with it very valuable. Asiatic lilies are the result of hybridization of 12 lily species native to Asia. They are the most commonly found lilies in the landscape market, and for good reason. They are very hardy in Alberta (to zone 2), easy to grow and are among the least expensive to purchase. 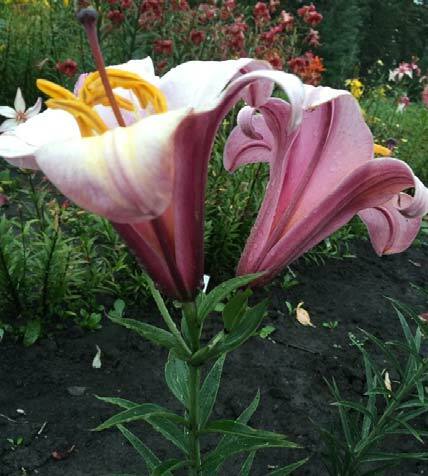 Asiatics multiply readily and bloom primarily in July and August, many individual cultivars bloom for up to two or more weeks.Because the hybrids are developed from a large group of species lilies, the resulting variation is broad. Bloom colours range from shades of white, pink, purple, to yellow, orange and red. Flowers can be outfacing, upfacing or downfacing. These are perfect lilies for a beginner grower. Martagon lilies stand out from the crowd. They are tall at 1.2 to 1.8 metres in height with numerous small, down-ward facing flowers with recurved petals – often upwards of 50 per stem. Flower colours range from white, yellow, pink, light purple and orange, to dark red, often with freckles and spots. Martagons bloom early, mainly in June and early July in Alberta, along with the earliest Asiatics. Theirleaves differ from other types of lilies, arranged in whorls with sets of leaves radiating out and staggered along the stem. Martagons have a tendency to emerge early making them prone to early frosts. This should be taken into consideration when choosing the best location. They are the most shade tolerant of all lilies, growing best in dappled, filtered shade, or morning sun with afternoon shade. Full shade does not produce the best blooms, and full sun may contribute to early emergence. Any location that may encourage early emergence, martagons may be prone to early frost damage which can cause flowers to abort. Martagons can often take a few years to settle in, putting up only short stems or refusing to bloom. Be patient as once established, martagons can be left to their own devices for many years. Much like peonies, they require little to no extra care or division. Martagons are still considered an expensive lily to purchase, in part because they can take up to 7 years to develop a bulb large enough to sell. But they are well worth the investment. This group includes hybrids from European species such as L. candidum (commonly known as the Madonna Lily). They have funnel-shaped flowers on stems 90 – 120 centimetres tall, and are often strongly fragrant. There are not many lilies in this division, they are not hardy in Alberta and are not often found for purchase. 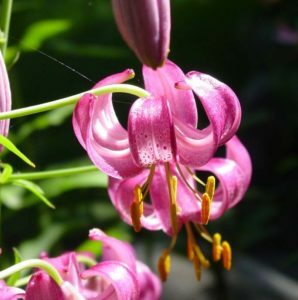 Division IV – American Hybrids (some are hardy in AB)Native lily species found in the Western US and Canada, these are typically found in dappled shade on the edge of woodlands. Species from which hybrids have been developed in this division include L. philadelphicum– the wood lily, Saskatchewan’s floral emblem and native to many parts of Alberta.Members of this Division are not often available for purchase. Division V – Longiflorum Hybrids (not hardy in AB)This group encompasses the hybrids derived from L. longiflorum (native to Japan) and L. formosanum (native to Taiwan) – most famous is the potted Easter Lily. They are not considered garden hardy. Division VI Trumpet and Aurelian Hybrids (hardy in AB – some require protection)Trumpet lilies are the elegant star of the garden. Tall, stately plants with large trumpet-shaped flowers, they are known for their incredible, strong fragrance. Bred from species found in China, varieties can be found with downward facing, bowl shaped or upfacing flowers. Colours exist beyond the familiar white to include yellows, chartreuse, pink, purple and peach. Aurelian hybrids arise from combining trumpet lilies with L. henry (native to China) which results in an increased level of hardiness. Flowers are medium to large trumpet-shaped as well as flat with reflexed tepals, or more open and bowl-shaped. Aurelian flowers s occur in white, cream, yellow, orange and pink and often have a contrasting star-shaped throat or bands of colour, also characteristics supplied by L. henryi. Trumpets will bloom first starting in July, followed by the Aurelians. Lilies in this division may need staking and early shoots may need to be protected from a late frost. Oriental hybrids include the ever popular Casa Blanca and Stargazer lilies, often found in floral arrangements. Developed from lily species native to Japan, They are known for their large stature (90-120 cm tall) and strong fragrance. Bloom colours include white, pink, purple and yellow, many with spots, markings or coloured margins. They are usually bowl-shaped, or flat with recurved tepals. They are somewhat tender, needing rich, well-amended acidic soil, and mulch to provide winter protection. It is often recommended to spring plant these on the prairies, and hope that they return the following year. When the Divisions were created in the 1960’s it was not thought possible that crosses could be made between Divisions, but interdivisional hybrids are now common, leading to many new plant and flower forms. Most common are the LA Hybrids (Longiflorum-Asiatic crosses), OT Hybrids (Orienpets or Oriental-Trumpet crosses), OA Hybrids (Oriental-Asiatic crosses), and LO Hybrids (L. longiflorum-Oriental crosses) among others. This Division has many of the newer breakthrough cultivars in high quality garden lilies. Division IX – Species Lilies (some are hardy in AB)This Division includes all the species lilies – the parents from which all the hybrids have been developed. 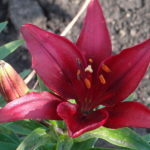 The RHS Lily Group also maintains the lily registry. 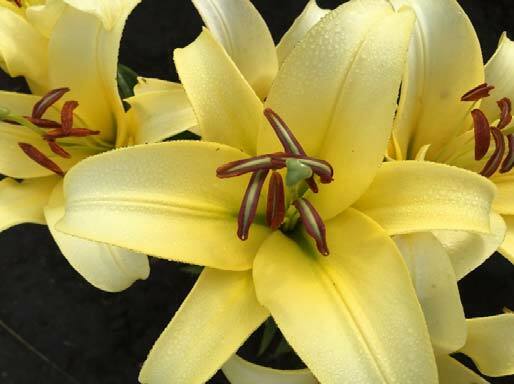 Although registration is voluntary and does not provide any legal protection on the plant, it is recommended that breeders register names to minimize potential confusion and avoid the duplication of lily names. Names must conform to the International Code of Nomenclature for Cultivated Plants to be accepted. The last published Register was in 2007 at over 900 pages. Supplements are released every year or two, each adding another 60+ pages.